BUT there is one thing that rings VERY true and that is this: Pinterest can kill SOME blogs, or shall I say, harm some bloggers. Here is why: Pinterest forces bloggers to STEP IT UP a notch simply because Pinterest is showing our readers EVERYTHING in one place. Pinterest is like a boat with a massive trawling net catching everything thanks to its massive member base. This sheer volume of stuff forces bloggers, magazines and even book publishers to step it up. I don't think that is a bad thing, the better we each nudge one another to become a bit more polished, then there is nothing wrong with that. Iron sharpens iron. The point is that none of us can repetitively toss up photos and leave it at that on our blogs. A little chit chat is needed. A little of, "I love this because..." and "This works because..." and "I think you can learn from this because..." goes a really long way for any blogger. If you want to add value through your blog content then put your heart into it. Be a bit more bold and lay your opinions openly out there, express yourself more freely than ever (as long as you don't become a meanie, not what I encourage), be honest and funny (if you want to be funny), be yourself... Blog YOUR way. That will set you apart from the pack. Then Pinterest does not threaten your beautiful blog - you can use it to promote your blog and Pinterest will continue to tap in to all of us who are using it for their content. Currently, Pinterest drives more traffic to decor8 than Google.com - so I'm not complaining - that's good stuff. Thanks, Pinterest. I wonder what your honest opinion is when it comes to Pinterest. Do you think it is killing blogs? Do you think it is making bloggers step back and reexamine their blogging approach? Do you USE the content you are pinning on Pinterest to create anything - are you doing anything with all of that inspiration? 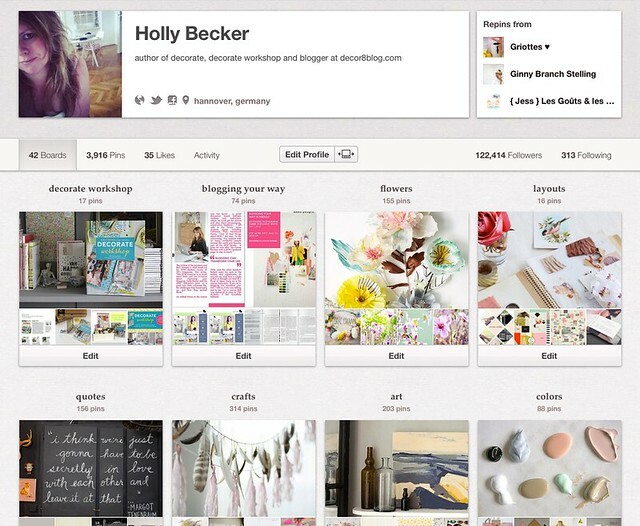 As a blogger, are you finding more traffic coming in to your blog from Pinterest? I'd love to hear your take on it. By the way, I'm on Pinterest. Follow me if you'd like, I'm @decor8.